I have done a lot of online research over the years about some of the details and instructions for interior house painting. I'm putting it out there that a lot of the information that one would find on the Internet is just plain wrong. This Painting Blog tries to help provide better painting information so hopefully it will be useful for both homeowners and other painting contractors alike. Summer is here but don't look now, but fall is just around the corner! 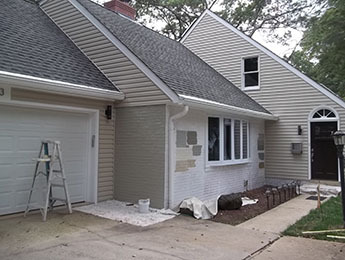 During late summer, many homeowners are in a rush to perform exterior painting before the snow falls, or perhaps clear out the gutters from the fallen leaves. More than likely a project like that will require the use of some type of step ladder or extension ladder. An extension ladder is an inherently dangerous piece of equipment that is utilized for all types of maintenance projects around the home. If they are not not set-up properly, a ladder can become unstable and any type of accident can result in serious injuries or property damage. As a professional painting company, we are acutely aware about how important ladder safety really is. In fact, we exercise continuous safety training for our painters and we regularly maintain our ladders to ensure a safe work environment. People with less experience using a ladder should familiarize themselves with basic ladder safety in order to prevent accidents from happening. It may seem like a straightforward process to set-up and climb a ladder, but in reality there are several safety procedures that must be taken into consideration. We’ve put together some practical information on ladder safety in order to help keep you, your property, and those around you safe. Different types of ladders are designed for certain projects. Make sure that the ladder’s height corresponds to its job. Painting a house will most likely require the use of an extension ladder, however, some areas of the house should be able to be completed with a step ladder. The ladder you select should be able to reach several feet beyond the highest point at which doing your work. Attempting to complete section of work with a ladder that is too short will encourage inexperienced people to over-stretch, and this can be hazardous. An extension ladder greater than 16 feet will almost require someone with experience, or perhaps two people to set it up. Don't Use a Broken Ladder! It is best to avoid ladders if it has broken parts such a jammed rung locks or bent rungs. Only professionals should work with ladders that do not have a halyard or rope used to raise the second ladder section. If you’re buying a ladder, look for safe standards that are OSHA approved, and read the instructions before using it. It is also important to make sure that the ladder is rated for your weight. Ladders are designed and constructed to safely hold up to a certain amount of weight, that would include the person and their tools. A ladder's Duty Rating is determined as the maximum load that is safe for a specific ladder. Climb the ladder slowly and carefully, and come down at the same rate that you went up. Without over-reaching, place one hand at a time on each rung, and climb 2 - 3 rungs with your feet and then stop, before reaching-up to the next 3 rungs. Maintain three points of contact on the ladder while climbing, for example, two hands and one foot, or two feet and one hand. Never climb higher than the third rung from the very top of an extension ladder. If you are using both hands to perform work, utilize another part of your body to maintain balance and support, such as your thigh or shoulder. Ensure that the feet of the ladder are secured on level ground or pavement and that there is no chance of anything to slip. If the ground is uneven or sloped, the use of a ladder stabilizer could provide an artificial level surface. Sometimes secure blocks can be fastened and or nailed into asphalt or slippery deck surfaces to safeguard against the possibility of an accident. The feet bases of extension ladders should be between 3 to 6 feet away from the side of the house, depending upon the height. It's also important to be aware of the resting point at the top of of a ladder to make sure that it is placed on a secure part of the exterior. Work Safely on the Ladder! Always brace your body first, to ensure you have the correct support in order to free a hand to perform work. If you’re painting a house, hang your 1/4 full paint bucket from a hook on the side of your ladder, and place your brush handle inside the rung. Carry tools that are secured in a tool belt, and raise or lower larger tools or materials using a second ladder with another person. Never work on any type of ladder with second person on the ladder at the same time. Moreover, it's simply dangerous to try to tie or fasten ladders together to form a longer section. Bouncing the ladder or leaning out far to extend the reach and maximize the ladder’s position is best left for a painting professional. Inexperienced people should take it slow, maintain their body position and shoulders within the width of the rails, and only reach out slightly farther than arms length. If you are on an extension ladder higher than 24 feet, it can be very time-consuming to go up and down the ladder and move it every five minutes. However, it is our advice to not stretch your body, keep your shoulders inside the ladder, and only paint safely that is within your normal reach. Never use an extension ladder during any kind of inclement weather, such as, the cold, rain, and wind. Strong wind can force a ladder to fall down and Mist and rain can cause a ladder to become slippery. It is not enough to simply not touch a power line with a ladder, because electricity can actually arc a fair distance from the wire and then make contact with the ladder. When moving a ladder around live wires, first completely collapse the ladder then move it horizontally, and set it up again, to the left or the right, beyond the wires. In some cases, it is even safer to completely skip a section, if it is not possible to safely set-up or work around electricity. If you are feeling weak, dizzy or you are prone to losing your balance, you should not attempt to do any kind of work involving a ladder. That being said, if you are not of sound mind and physical condition. the chances of getting seriously hurt are much greater. Moreover, individuals who use extension ladders should be physically capable to use the ladder on their own, or with help. People who are too old, too young, or have health or physical concerns should leave projects involving a ladder to a professional. It's not worth the risk, and there will always be another day to climb a ladder if you are not feeling well. The most important thing to remember when using a ladder is to just use common sense. If you don't have years of experience working with a ladder, then take it slow and be careful and diligent about your safety and the safety of those around you. Moreover, ladders are not designed to be used as a platform for working. For complicated jobs such as painting high ceilings, think about using scaffolding or hiring Painters in Northern Virginia instead. No type of project involving crown molding installation, gutter cleaning, or painting is worth risking your life or hurting someone else. Please give us a call at Davinci's Painting, for any kind of painting or drywall need you have in your Home. We have decades and decades of experience working with ladders in very high places! Our reputation means everything to us. We work very hard and make it so that every job must be a job of which we can be proud. We are an exceptional Painting Company in Northern Virginia and Washington DC, and we would welcome the opportunity to provide you with our museum quality service!